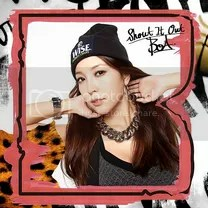 Shout It Out is the thirty-sixth Japanese single released by South-Korean singer BoA on March 5, 2014. The single debuted at #9 on the Oricon Daily Charts and has sold 7,515 copies to date. I can’t remember when BoA last released an exciting and upbeat single, but Shout It Out caught my attention from the very first moment the PV became available. I enjoyed it so much that I was very disappointed the release date got pushed back a month. BoA knows how to do dance influenced pop songs that are very danceable, it comes close to the style she displayed in some older songs that I liked very much. Loved the vocals as well, please put this on an album TBR this year. close to me is the ballad song on the single, just like the title suggests if you ask me. The acoustic guitar opening the song with BoA’s voice softly singing along gave me instant goosebumps, it’s not your typical J-Pop ballad but more Americanized if you know what I mean. I think this is the best BoA ballad I have heard in a very long time, I’m so impressed by the overall sound. The English/Japanese alteration is very smooth, I think I’d like a full English version sometime! For this to NOT have a comment on one of BoA’s best singles was inexcusable; so here is one! Okay, I can sleep at nights now.